However, Default Folder X might be a bit of overkill for your needs, and at $35, it’s not an inexpensive solution. If you’re running OS X 10.5, though, you can create a do-it-yourself solution that provides quick access to folders in the Open and Save dialogs on an application-by-application basis. The key to this solution is the sidebar, which not only appears in Finder windows, but in Open and Save dialogs as well. The sidebar displays sections for Devices, Shared, Places, and (the key to this hint) Saved Searches. You’re probably familiar with Saved Searches—this section of the sidebar displays any Smart Folders (saved Spotlight searches) you’ve created. As you may know, Spotlight is accessible in the Open and Save dialogs in OS X 10.5—just type some text in the search box, and then (if necessary) click the plus sign to add additional search criteria. Using Spotlight in Open and Save dialogs can make it very easy to find even the most deeply-buried of files and/or folders…but its powers don’t end there. After you’ve set up a Spotlight search in an Open or Save dialog, notice that there’s a Save button. Click that, and you can save your search for future use. In the save sheet that drops down, supply a name for your saved search and…here’s the nifty trick…check the ‘Display Smart Folder for this Application Only’ checkbox. With that box checked, the Smart Folder you create will appear only in the Open and Save dialog of the program in which it was created. 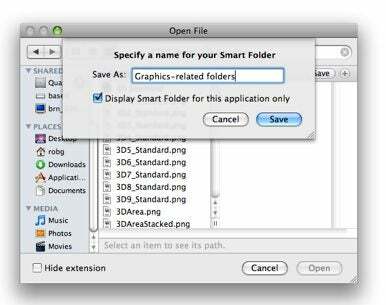 Using this simple tip, you can set up different Smart Folders to quickly jump to those folders you use most often in your preferred applications. While this is nowhere near the comprehensive solution you’ll get with Default Folder X, it’s also quite functional and completely free, assuming you own OS X 10.5.